One new club at BSGE this year is a knitting club, supervised and started by Ms. Shen. She started it because she is interested in knitting and wants to share her interest with the school. The club meets in the library immediately after school every Thursday, and has members from a variety of grades. Meetings officially last until 3:45, but most people usually leave by 3:15. Most members work on knitting scarves, because those are easiest for beginners to make. However, some have been making headbands. During a typical meeting, members sit in the lounge area of the library. 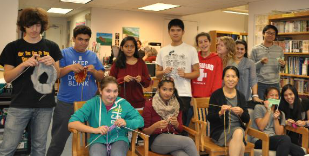 Ms. Shen described them as knitting while they “talk about issues that are interesting in their lives. Stress is totally off their minds. It’s so relaxed…a real fun environment.” If you’ve ever wanted to learn a new skill, a place to relax, or both, the knitting club might be right for you.